Hippity hoppity, Easter's on its way. I know because my pink flamingo finally got its rabbit ears. Yes, we're livin' large here at Garden Faerie's Musings. 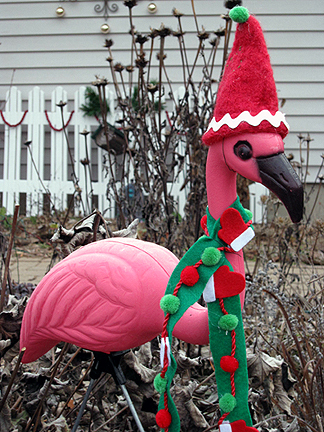 Back in early December, I managed to find a Santa hat (purchased as an ornament for 25¢ at the Ann Arbor ReUse Center), and to make a scarf from random scraps, for Pinky, the pink flamingo that graces my front yard. Since I'm not very crafty, I was rather pleased with myself. For St. Patrick's Day, I removed the hat and turned the scarf around so it was green. Today I went back to the ReUse Center and found this homemade magnet for 25¢. And hey bang presto, nothing up my sleeve! five minutes later I had turned it into the rabbit ears above. I'm really pleased with how that turned out, too. The photo tickles me no end. I've said it before, and I'll say it again, pink flamingos really add a touch of class to the garden. Breaking News: For immediate release. For the first time in 40 years, against all odds, not one, but two (2) Lindt chocolate rabbits have survived unscathed in the home of the Garden Faerie for well over a month now. A well-known chocoholic famous for finishing multiple chocolate rabbits well before Easter, the Garden Faerie is as dumbfounded as the rest of us about the origin of her new-found will power. "A dark chocolate one (not shown) is for my mom, but for me an Easter rabbit has to be milk chocolate (pictured)," the Faerie was quoted as saying by a neighbor, who saw her clutching the rabbits and muttering quietly to herself. We have confirmed reports that the sugar-free Peeps are long since gone. Nein, was für ein lustiger Post heute, liebe Monica. Der Einkauf des Hasen war super, so sieht Dein Flamingo wirklich modisch gut gekleidet aus ;-). Ich liebe die Lindt-Hoppelhasen mit dem Glöckchen. Allerdings mag ich auch Vollmilch-Schokolade am aller liebsten. I had no clue there were such things as sugar-free peeps. And now I need to watch the Peep Tarantella on YouTube. Pinky is adorable in rabbit ears Monica! Very creative, frugal fun. Alas, a certain gift package of chocolate bunnies, chocolate-covered peeps, Cadbury caramel eggs, etc., has already disappeared from our house. We admire your will power! LOL! Since some of my habits are rubbing off on you, will your pink flamingo habit rub off on me? I'm starting to think that it would help me blend in better with the neighbor's tacky faux tree landscaping, don't ya think? Pinky is adorable in her Easter finery. She really does add a touch of class to the garden. We have already consumed mass quantities of jelly beans and Reese's peanut butter eggs--but nothing comes close to taking a big chunk of bunny ears--and yours look ripe for the pickin'! Such will power is unimaginable around here. I think your pink flamingo is darling with its Easter Ears on. There was once a flock of them in my garden until they became so faded that they were terminated. Nothing worse than a faded flamingo. Gosh, did you say chocolate? I must go see what I can find around here. Is that legal, to put rabbit ears on a flamingo? lol It might be too cute to be allowed. "Sugar free Peeps"? What on earth are they made from if not sugar? Insulation? (Just kidding! My weakness is tapioca pudding and sugar cookies...to each his own :) Happy (early) Easter! Nice rabbit! Just a tip for 8 months from now: A good friend of mine has reindeer antler for his flamingos. Very festive and becoming. You never cease to amaze me, dear Monica! I hate to stay away too long for fear I might miss something :) Would Pinky make a cute Uncle Sam? That flamingo with the rabbit ears is awesome! I'd qualify that as most crafty and clever. Good luck on the bunnies! We are busy scarfing down Cadbury chocolate eggs. Reminder, must not buy anymore. You've done so well with the bunnies! I don't think I could do it. I feel a lot better about the flamingo now, knowing she has warm ears. I can see you are an excellent judge of chocolate. That dark stuff is bitter--no temptation there. It must be sweet and creamy. LOL, that flamingo is awesome Monica - it really made me laughand brightened up a very grey drizzly day! Those bunny ears are the cutest thing ever!! Thanks for reminding me that I need a chocolate bunny. I've been unusually good this year and that needs to stop. I have two pink flamingoes myself that live near my goldfish pond. They are named Paris and Nicole and usually wear jewelry of some kind. I may have to fashion other sportswear for them after seeing yours! I don't know how you do it. Those Lindor rabbits would have disappeared long ago in my house. My son learned, at an early age, to hide anything chocolate from me. 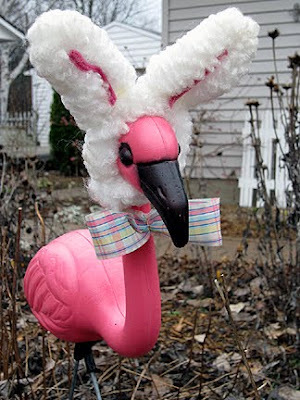 Your Easter flamingo outfit is classy ~ I loved seeing the Christmas one too. I hope Pinky gets some chocolate for Easter. OMGosh, I am so laughing right now! I have had so much fun with my bunnies in the woods. Hubby was trying to convince me that I am a bit on the crazy side but I see you have me beat with this one, lol. Thanks so much for this posting as I will make sure my hubby sees it so he no longer thinks I am crazy! LOL, I'm not crazy about pink flamingos, but yours certainly has a charm about it, Monica:) Love those rabbit ears! 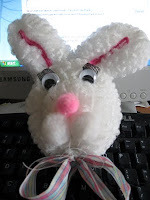 Oh my gosh -- I love Pinky in the rabbit ears! Too, too cute. Chocolate doesn't last here either. You are right about pink flamingos classing up a garden and sporting an Easter bonnet just raises the bar. Very elegant. LOL. I don't know why I doubted you when you said you made outfits for your flamingo. Love your humor Monica!! Oh boy we had NOT get together..two chocoholics in the garden..that could be messy sight! Happy Easter Monica blessings to you abd BTW love the furry ears on pinky! Um. Do lots of people have pink flamingoes. Um . . .
And you are getting craftier and craftier. Craftful? Craftish? Would the flamingo like ivy growing up over it, do you think? Or a howdah on top? Happy Easter, when it comes, Monica. That's funny and cute! I remember what we did for the reindeer invasion in Florida. It's always nice to see your garden also themed up for the season. Have a happy Easter! Love the new theme. Came via a retweet on twitter! Simple, clean and elegant.